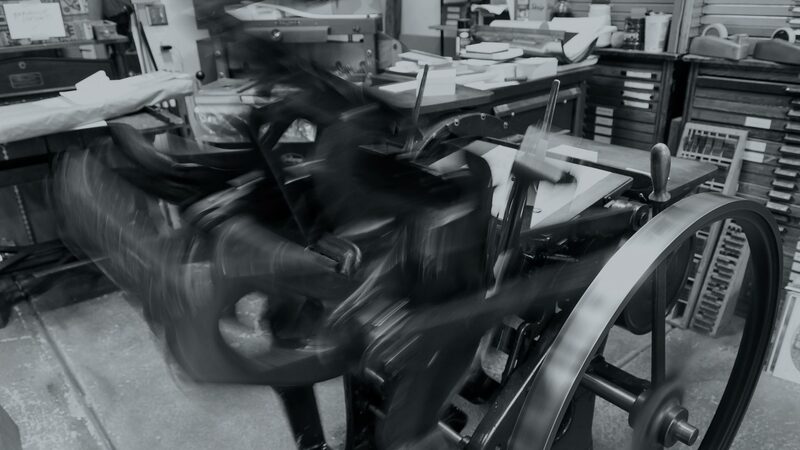 About • Smokeproof Press • Letterpress printing and design in Boulder, Colorado. When Smokeproof Press was born, letterpress printing was an endangered art form. Now, it’s enjoying a resurgence as people seek more personal, tactile methods of communication. And we’ve been a part of the resurgence, adding our own perspective and funky spin to the contemporary letterpress scene. Hand-set type to small press imprint to job printing. Smokeproof proprietor Brad O’Sullivan discovered letterpress printing as a graduate student at the Naropa Institute in the early ’90s. After taking an introductory letterpress course, he continued teaching himself by reading everything he could find on typography, printing and design, and collaborating with dozens of writers and artists in the production of chapbooks, broadsides and book covers. He eventually began teaching letterpress printing at Naropa in 1996 and continues to this day. After graduating, Brad continued honing his letterpress skills by taking on jobwork, collaborating with local and national writers, and publishing a small line of chapbooks under the Smokeproof Press imprint. He worked for several years in the paper industry, both commercial and boutique, and assisted a local paperie in establishing a custom printing business. In 2004, he moved all of his equipment into a proper workshop and hung the shingle under which Smokeproof Press continues to grow and thrive. What projects work with letterpress printing? Just about any project can work via letterpress: Invitations. Postcards. Business cards. Tickets. Chapbooks. LP & CD covers. Birth announcements. Greeting cards. Labels. Posters. Hangtags. Liner notes. Presentation folders. Letterhead. In short, we print a little bit of everything, so the best way to understand what we can do and how we do it is to actually look through our work. You can provide us with a press-ready design. In the former case, we’ll happily work up a design estimate for you based on your specific needs and desires for the project. If you already have a completed design, or if you’re working with a designer, please refer to our design specifications to ensure that your files are ready for print. We’ve collaborated with dozens of clients and designers across the Americas and Europe. Whichever design option you choose, we’ll do our level best to achieve outstanding results based on the design and materials specifications of your project. Old-school in a new way. Brad teaches undergraduate and graduate students at Naropa’s Jack Kerouac School of Disembodied Poetics, and he’s a letterpress instructor for Naropa’s Summer Writing Program. Additionally, he has assisted individuals and schools to both set up letterpress workspaces of varying sizes and to fine-tune workspace operations. As a consultant, Brad can assist established and aspiring letterpress printers in everything from shop layout to press maintenance & repair and nittygritty printing techniques. A reversal of the apprentice scheme: we’ll come to you. At this time, Brad is unable to offer letterpress classes at the Smokeproof Press workshop. However, he is available to travel to your printshop as a consultant or to teach. Teaching subjects may be introductory in nature, for uninitiated printers or enthusiasts, or they may be more specific for printers looking to hone their skills or to learn how to use, maintain & troubleshoot a particular press and its idiosyncrasies. Please inquire about Brad’s availability for consultation and teaching. Word of mouth, and then some. We are so happy that we found out about Smokeproof Press! We came to Brad with a basic idea of what we wanted for our wedding invitations. After looking through his website and his work in person, we really wanted him to use his own creativity with our project. Brad was incredibly professional and hardworking. He always sent us his ideas right away, letting us know we were important to him. You can really tell that Brad cares deeply about his craft, and that shows in each of his unique works of art. We just picked up our invitations today and could not be any happier! Our clients demand the absolute best, so we use Smokeproof Press for nearly all our letterpress needs. Brad is a bona fide artist, delivering perfection piece after piece after piece. With beautiful impressions that strike the balance between texture and legibility, the finest attention to detail, an exemplary work ethic, and a working relationship that is refreshingly easy, Smokeproof is simply the best there is. Brad is the BEST. We wanted to create a wedding invitation that was wholly our own and Brad nailed it for us. He is super creative, enthusiastic and worked hard for/with us to create a really unique and amazing invite. We even had a guest refuse to return the RSVP because he wanted to keep the whole invite – that’s how great they turned out. Amazing work, BradO, Thanks! It is always a joy to look at Brad’s work. It is done with a passion of a craftsman like no other and it shows in every tightly registered detail. I always look for the chance to work together.